Pirates. Who doesn’t love pirates? From their salty sea humour (who’s a pirate’s favourite singer? Aaaarithra Franklin. Geddit?) to their unashamed love of bling and booty, pirates are second only to Jedi’s in their cool ranking. So, when German developer Piranha Bytes decided to bolt on a nautical pirate theme to their acclaimed Risen series, what could possibly go wrong? A few things it seems. Set in a post-Apocalyptic world ravaged by ancient gods known as Titans, Risen 2: Dark Waters casts you in the role of an unnamed hero tasked with scouring the Earth for a weapon that could save mankind. The most fearsome of the Titans is Mara who, although rarely appearing in the game, remains a constant and malevolent presence throughout the adventure. The game begins on the Fortress of Crystal at the port of Caldera, the last refuge of the Inquisition, the nearest thing the world has to an organised military force. Patty, the sabre-wielding eye candy pirate (Aye candy? Groan.) has washed ashore with news that her father, the feared pirate captain Steel Beard, has discovered a weapon that could be used to finally defeat Mara and the Titans. It is your task then to sail from island to island in search of the weapon. So far, pretty standard fare then. The game features all of the expected elements of a fairly decent RPG: intriguing plot lines and dialogue, obligatory side quests and missions, character levelling up and skill enhancements. Yet, while Risen 2: Dark Waters ticks all of the aforementioned boxes, it rarely excels in any one particular department. And, quite often, when the developer gives you a treat with one hand, it, inexplicably, takes something away with the another. For example, Piranha Bytes has done a praiseworthy job with the colourful in-game characters with their quirky yet not scene-stealing personalities. The dialogue will often solicit a chuckle or two and occasionally you’ll raise an eyebrow at the liberal use of colourful profanity. Yet the lead character’s lines are delivered in the same flat monotone voice that marred the last Risen outing. Honestly, we’ve seen more life inside a coffin. The graphics are also a mixed bag. The islands that you visit are, for the most part, truly stunning. The rippling water effects are on par with anything we’ve seen and the vegetation and use of lighting and shadow second to none. Remember the first time you saw Uncharted? Well, it’s nearly that good. Yet what would otherwise be stellar graphics are let down by poor character facial animation and dodgy lip synching. 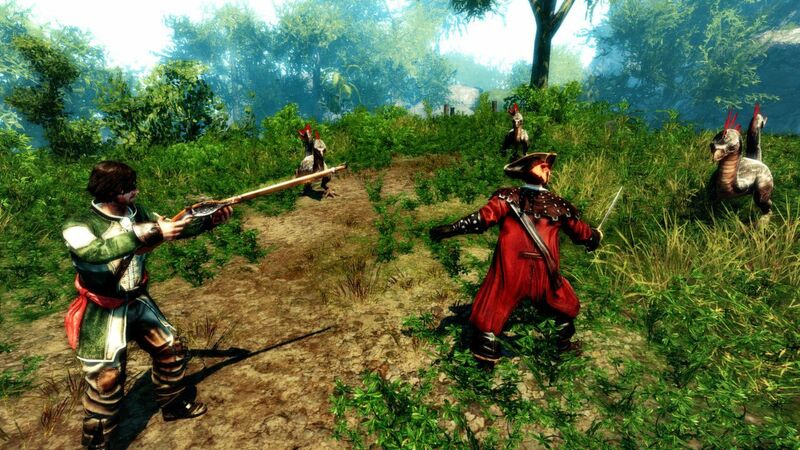 Risen 2’s combat system could also have done with a couple of extra days cooking in the lab. Your character has two weapon slots. In the right hand the player wields bladed weapons such as a cutlass or a two-handed rifle, while in the left hand is the secondary item such as a pistol or non-damaging items like throwing sand to blind opponents. Pretty straight forward so far. But this simplicity is let down by a frustrating camera that struggles to keep up with the in-game action. The result is that you’re often left fighting an enemy that you can’t see (because they’re off camera) and swinging your cutlass blindly in the hope that you’ll hit something. 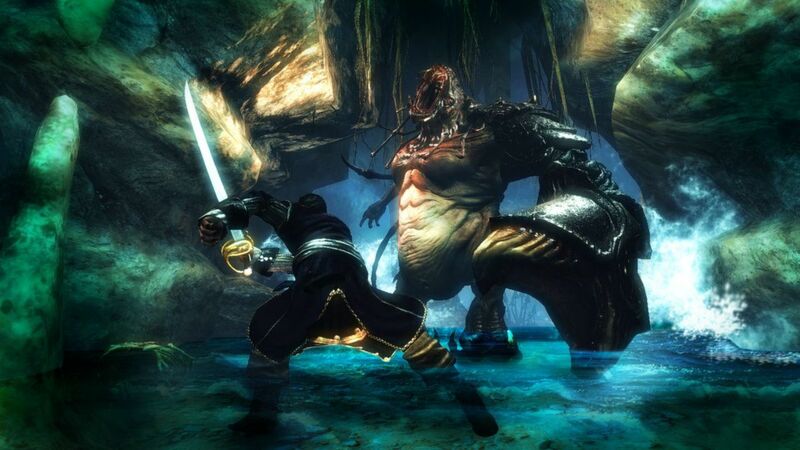 Oh, and a word of warning about the combat: During the early stages of the game, many of the enemies you’ll encounter in Risen 2: Dark Waters will be tougher than a grizzly bear armed with a flick knife. Your character will struggle against most of them until you increase your skills. Character development is handled by use of five key attributes: The “Blades” attribute, which improves your ability with swords, and daggers; “Firearms”, which looks after your use of pistols and rifles; “Toughness”, which is how much damage you can take; “Cunning”, stealth skills including sneaking, stealing and talking your way into and out of problems and, my favourite attribute, “Voodoo”, which lets you use black magic such as the ability to make enemies fight each other. You increase your attributes by earning glory (the in-game currency) which you can stack up by completing quests and killing enemies. Once again, on paper, these attributes work very well. But, in practice, acquiring enough glory to improve your character can take what seems like forever. And until then, you will die, die, die and die again. You have been warned. Although far from fatal, these bugs and gripes could put off many but the most hardened RPG fans. But with that thought in mind, it has to be said that Risen 2: Dark Waters is still a pretty damned good game. Did we mention it had pirates? Also, with a bucket load of side missions and quests, challenging puzzles and gorgeous graphics, you have 20 to 25 hours of gameplay that will keep you entertained between doses of COD and Forza. If you can overlook Risen 2’s shortcomings you will discover a game that, while not, re-writing the book, does a fairly decent job at adding its own chapter.